Media decision makers in the West usually confront complex ethical dilemmas from a utilitarian perspective, which means they make decisions based upon "the greatest good for the greatest number." Although the utilitarian approach has many strengths, critics point out that the final arbiter of what is best for the community falls upon the individual communicator, who is not always in a good position to make such a determination. 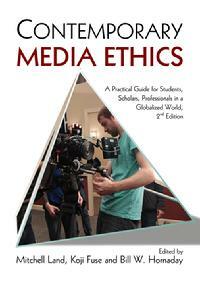 This book, the second edition of Contemporary Media Ethics, continues to follow the Point-of-Decision Pyramid Model introduced in the first edition. But it substitutes communitarianism in most of the analyses with non-utilitarian approaches used around the world, making this one of the most unique mass media ethics books on the market. Mitchell Land (Ph.D. University of Texas at Austin) is professor and dean of Regent University’s School of Communication and the Arts. Koji Fuse (Ph.D., University of Texas at Austin) is associate professor of strategic communication at the University of North Texas. Bill W. Hornaday (M.J., University of North Texas) is co-researcher for the Student Media Ethics Project at Indiana University School of Journalism.